Munchkin Munchies: We All Scream for Ice Cream! Who doesn't love ice cream? It comes in so many flavors that you have to favor at least one. It can be eaten in a bowl, a cone, on a stick, in pie or as a cake! Well, if you happen to be one of the few that doesn't care for ice cream (or are lactose intolerant), these cookies are for you, and ice cream fans alike. I have been so smitten lately with all the adorable ice cream related cookies on facebook and blogs, that I've been itching to make my own. It was such a fun cookie project! I was only going to put faces on a few of them, but could not stop once I started :) I'm sort of attached to them now. Did you notice the tiny ice cream cones? They are actually marshmallows. I dipped some in candy melts, and the others in leftover royal icing (pink, blue), added sprinkles and then topped each with a cherry (mini m&m). I snatched this cute idea from the creative Kim, The Partiologist . Check out her tutorial (and blog) right HERE. You'll be glad you did! 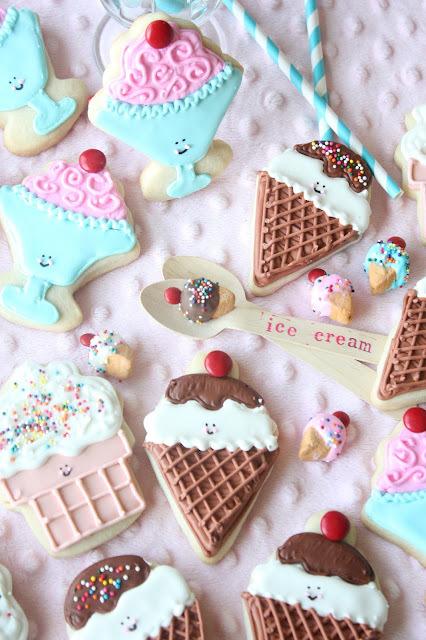 If you'd like some ice cream cookies, simply make a batch of sugar cookie dough, and some royal icing. Add some food coloring to the icing to make any "flavors" you'd like. Don't forget the sprinkles, and top with "cherries" too~regular and mini, red m&m candies. I want to eat these photos, they're simply delicious. Really, really, really lovely and precious and adorable. Did I mention they're really lovely?.... Because they are. :) Great job! Aww, thanks so much for the shout out - love how you topped those little mini's with a cherry! Wish you were around when I was taking photos - yours are fantastic!!! Not to mention the adorable ice cream cone and sundae cookies! I hope you're having a party - these cookies need to celebrate! You are an artist my dear--a cookie artist. The sweetest kind! SQUEEE! you had me at hello screaming at all the cuteness! I think these are the most adorable cookies I've ever seen! What an amazing assortment of ice cream themed cookies. The bowl of ice cream is so unique. Oh, and I love the faces! 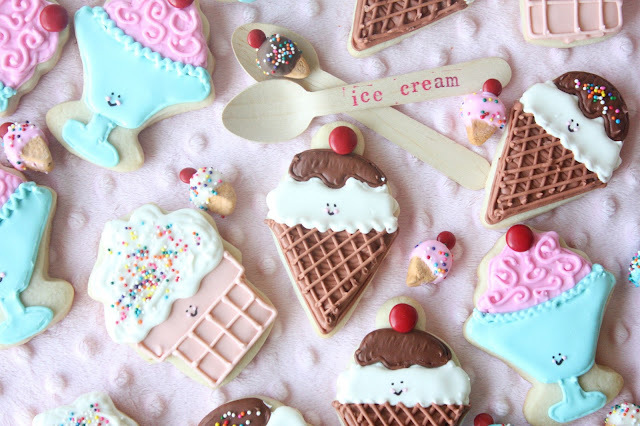 they are almost too cute to eat, almost! love the little bitty ones too! We just went to the ice cream shop and it was $3 for one scoop! Good thing it is not 10 cents anymore or my hips might be wearing ice cream. The cookies are so so cute, I can't choose a favorite. Absolutely the BEST thing I've seen in a LONG time! ADORABLE!!! These are SO cute Sue! Soooo adorable! And the decorating workmanship is impeccable! So adorable and beautiful, Sue. How fun, especially for summer! I'd want to serve them with ice cream. 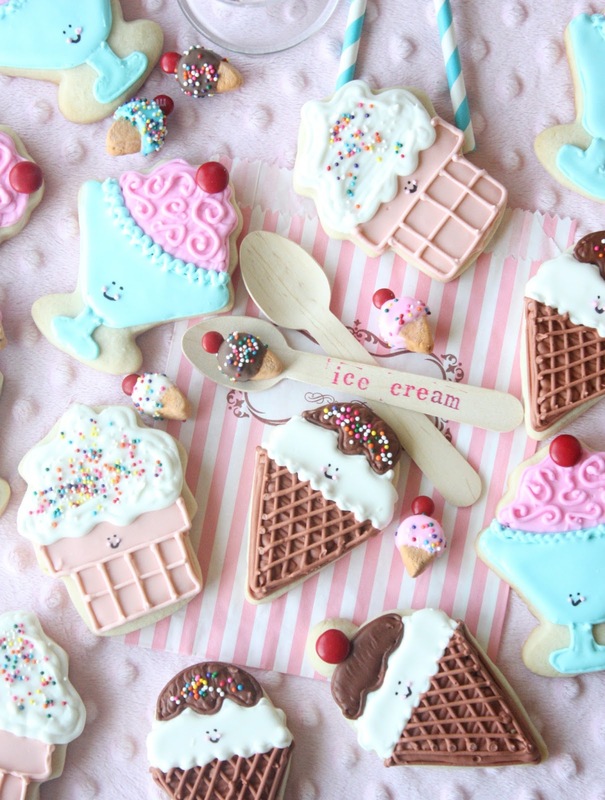 These cookies are super cute! Everything you do is unbelievable, but I think this is one of my favorites ever! I love the colors and textures and then to add that little pop with a darling face - everything just comes alive. I definitely need to get brave and try these some time. This is something my kids would love. Why haven’t I thought of this before after so many years of baking cookies?  Food crafts like this are exciting for me as I love baking cookies and using my creativity designing them. If you don’t want your ice cream to melt this summer, this is the perfect solution. I have to admit your designs are very imaginative. Oh my gooodness, how cute are these?! I want them all! I LOVE THESE!!! The cute little smiles.... the adorable tiny miniature cones!! And such beautiful photos! I just want to squeeze the bejeezus out of these. Soo flippin cute!